NEW Nintendo 3DS XL ‘Pokemon Sun & Moon’ Edition Announced – 3WIREL! Nintendo announced a special New Nintendo 3DS XL being themed after the upcoming Pokemon Sun & Moon! for the launches of both the Pokémon Sun and Pokémon Moon games on Nov. 18, fans will be able to purchase a New Nintendo 3DS XL system inspired by the games starting on Oct. 28 at the suggested retail price of $199.99. That’s three weeks before the games come out – plenty of time to break the system in before diving into the new Pokémon adventures (sold separately). 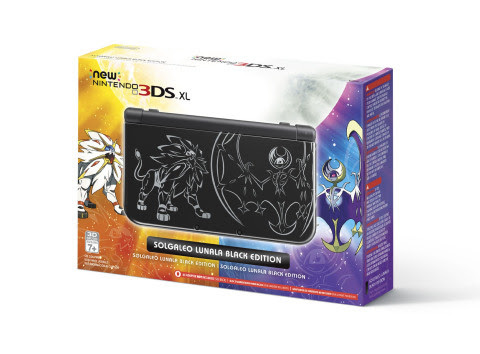 The limited-edition system sports a slick black color with both of the new Legendary Pokémon, Solgaleo and Lunala, gracing the cover. This part of celebrating the franchise’s 20th anniversary alongside many other releases and events celebrating the IP. The Pokemon Sun & Moon New Nintendo 3DS XL will contain only the system, NOT the Pokemon Sun & Moon title.